Have you ever lost a file in the depths of your system and spent ages trying to find it? Have you ever put in hours of work on version 1 because you didn't know version 2 was current? ...or started a fresh drawing because you didn't know about the existing file that was halfway there? Thought - if only we could index all our drawings and documents on this item of information? Then Design Manager is for you - it will give you more power and more control, guaranteed. 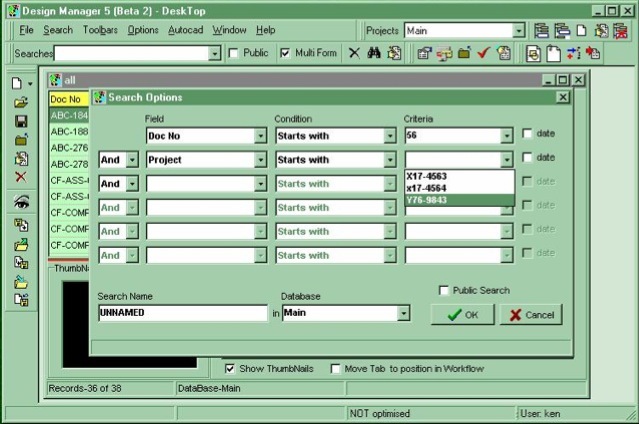 Design Manager is a powerful document database and management system. It will put you back in charge of your technical documents. It will give you the means to create, locate, manage and control all of your documents and drawings easily, quickly and professionally. From the individual draughtsman through to the company seeking ISO9001, Design Manager offers you control and the power to maximise your IT investment. Set-up is Simple Design Manager is so simple to set-up, implementation costs remain low. A 'getting started' booklet is supplied and comprehensive on-line help is available. A client/server option is included which, as well as improving performance on a busy network, makes operation over a WAN or dial-up connection feasible. Great emphasis has been placed on the user interface, which is fully Windows compliant and very easy to use. Design Manager lets you customise your user interface to meet your exact needs. This can include such things as custom field names, lengths and display layouts for example. Design Manager has a built in security system so that each user can be given a status, such as administrator or checker which denotes the level of access they have. This prevents editing by unauthorised persons etc. Design Manager is fully persistent between sessions, which will save you time and effort if you wish to return to a particular place when you restart, as you will be taken to where you left off, automatically. Create Documents Easily Design Manager provides a fast and simple method of creating new documents. On registration of the document, you can enter information into any of Design Manager's database fields. These fields can be named as you choose - and all of them can be displayed in the order you devise. Pop-up lists of pre-defined information aid accurate data entry. Design Manager includes an automatic document numbering facility which will save you time and ensure that each document is given an exclusive number. The multiple sheet document register means that you can use the same document number but with different sheet numbers and still maintain a unique registration within Design Manager. Drawing title block insertion and updating ensures that the information held in Design Manager matches the information on the drawing. Design Manager handles any sort of document from AutoCAD drawings and Word documents to Excel spreadsheets. Searches enable the selection of groups of documents from the whole, by searching on whichever fields you wish. Examples include searching to identify documents for the same customer or job; documents suitable as prototypes and documents that are issued or of a certain status. This means that it is always easy to locate related documents. All searches can be named and saved for future use. Each user can have their own pre-saved searches that can be called up on demand. Typical uses may include 'current jobs' or named block libraries. Searches can also be designated as public, enabling them to be used by anybody but they can only be edited or deleted by the originator - this will save you time because the search only has to be defined once. Search results from multiple databases can be displayed on screen simultaneously which makes it easy to collate data and make comparisons. 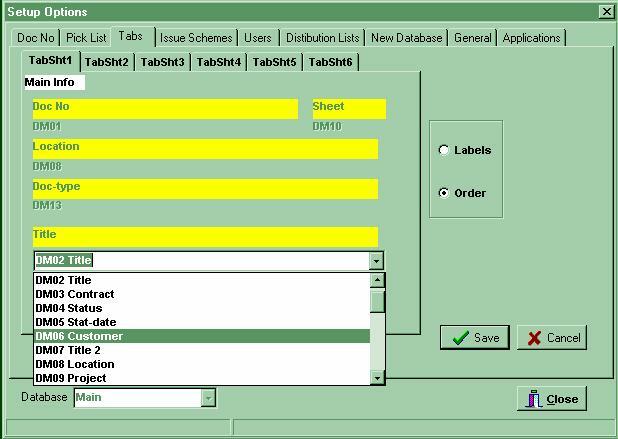 Design Manager also includes an existing database conversion routine for legacy data from other drawing management systems-so you can easily access documents from a previous version of Design Manager for example. In addition to recording document information in text form, Design Manager includes a viewer. This offers a fast, visual confirmation of the document that has been selected and on drawings allows you to zoom, pan, save as DXF/DWF or other version and draft print, where appropriate. A red-line mark up facility is included for drawing annotation, which allows you to convey ideas and changes visually. 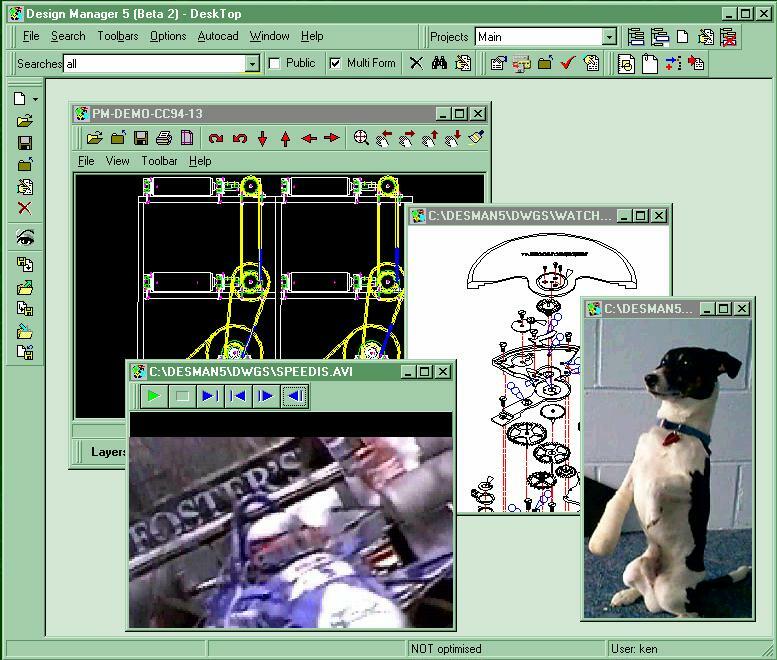 The Design Manager viewer enables the integrated viewing of drawings and several image types including: TIFF, JPG, GIF, WMF, BMP, AVI (Video), DWG and DXF etc. 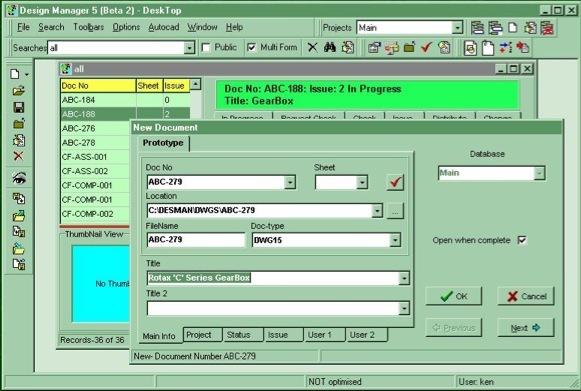 The logical progress of a document through the system is displayed on the user interface. This allows you to easily keep track of the stage a document is at i.e. to be checked, approved etc. And you can drive the process from this toolbar as well. Design Manager adopts a 'wizard' type approach to document processing and notifies personnel by e-mail when a document needs to be checked or approved. Design Manager also includes several reporting functions including Time in document(s), Awaiting approval, File location, Document transmittal, Awaiting check etc. 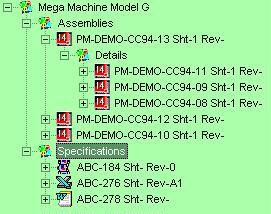 This makes it easy for you to obtain and analyse information held within Design Manager. Design Manager now includes Red-lining, this means that you will be able to show clearly and simply where modifications are required on a drawing or document without lengthy, text descriptions. Document Issue control ensures that you do not build to the wrong revision and that changes are logged, whilst Document Distribution control helps you to keep track of who has been sent drawings, how many and when. Modifications change/control makes sure that reasons for any changes are well documented. Projects can be built from any document registered with Design Manager. Projects are displayed in a 'family tree' enabling you to see the relationship between documents easily. Unlike searches, which produce groups of documents related by common criteria, projects are groups of documents related arbitrarily. That is to say, they are only related because you want them to be. So, you can relate such documents as specifications, calculations, videos and drawings or you can combine parts into a Bill of Materials (BOM). Design Manager can easily be configured to work with almost any application but comes complete with drivers for: AutoCAD, AutoCAD LT, Mechanical Desktop, AutoDesk Inventor, IntelliCAD and the Microsoft Office family on Windows XP, Vista and Windows 7 operating systems. Design Manager is compatible with AutoDesk Inventor, AutoCAD, AutoCAD LT (some restriction apply). AutoDesk Inventor Click here for more Information. Voyager This is restricted to searching and viewing only (Redlining is also available). It is particularly suitable for those that need to search for Design Information, see the Workflow status, View, Mark up (without changing) and Print Drawings. Typical uses are on the Shop Floor or in a Sales Office. Any document type can be managed. It has all the functionality of Lite and Voyager. It also gives you the ability to Find, Control and Organise ALL your technical Documents and Drawings. This is an add on module to Full Design Manager that allows part information to be managed and Bills of Material and Cutting Lists to be produced. Click here for more Information. Interested? If you have any questions or would like information on prices, dealers or demonstrations please call or Email our friendly sales team, who will be happy to help you.